Lenny (Aubrey Plaza) is in her command center. It has maps and monitors all along the wall. Amy (Katie Aselton) is sitting against the wall in a torpid state. Lenny wakes her from her stupor to ask her about the night that David arrived. Amy was only four and she didn’t really see anything, but Lenny won’t take that for an answer. Amy remembers sneaking out of her room and seeing a man give David to her parents but that is about it. Lenny angrily keeps asking Amy, “What did he do with it?” What is Lenny looking for? 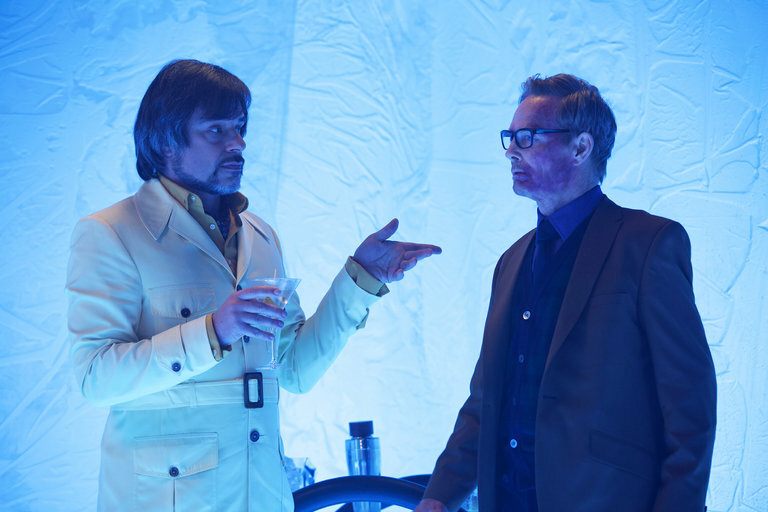 In the last episode Cary (Bill Irwin) was following Oliver (Jemaine Clement), Cary enters Oliver’s ice cube. Oliver’s memory is faulty; he doesn’t remember Melanie. He thinks he was married to an Asian woman. Oliver has been watching David’s monster. Cary had already figured out that it is a parasite living in David. Oliver knows who the parasite is, Farouk. Hearing this, Cary remembers who Farouk is; he is Amahl Farouk, the Shadow King. They agree that they need to save everyone. They will need David since he is powerful enough to unfreeze everyone in the room and keep them from dying. They will need the group’s help in freeing David. Cary goes to Syd’s (Rachel Keller) room to awaken her. He takes her to a circular booth so Farouk won’t hear them. Syd had already figured out the hospital was a fantasy created by the creature. She is going to go back to the hospital to get the others. Cary gives her some glasses that Oliver created that will let her and the others see realty. When she gets back to the hospital, it has fallen into complete chaos. People are wondering madly around it. When she puts on the glasses, the people disappear and everything appears in black and white. The alarms are still blaring. David (Dan Stevens) is in his coffin freaking out. Someone in a diving suit led Melanie (Jean Smart) out of the hospital during the last episode. To Melanie’s disappointment, it was Cary, but behind her, she hears Oliver reciting a limerick. He introduces himself; unfortunately, he doesn’t remember who she is. Melanie finds blood going up to the ceiling, she investigates and finds Rudy (Brad Mann) stabbed. She whispers something to him. We flashback to the Clockwork staff led by Amy cleaning him up and putting him in the wheelchair. Syd is walking through the hallways calling out for her friends. She finds Rudy and puts a pair of glasses on him. She spots Kerry putting a bar through a door to keep the Eye out of the room. Syd gives her a pair of glasses. Kerry, Syd and Rudy go down the hallway looking for the others. Cary and Melanie try to move David and Syd’s bodies from the bullets heading their way. Oliver has a better idea. The music from Maurice Ravel’s “Bolero” begins to play. Oliver is building a shield around David and Syd with the letters SHIELD around them. Cary gets the halo from himself so he can put it on David’s head. David uses his psychic power to burst of the box, but the doors he keeps going through take him back to the point he started. The Eye attacks Kerry and knocks off her glasses. Kerry fights the hordes of people surrounding her. To Syd it looks like Kerry is fighting air. The Eye attacks Kerry again, this time Syd joins Kerry in fighting him. Lenny sees this from her control center and joins the fun. The audible goes out and the scene is in black and white like a silent horror film. Lenny is the monster. She tires of the Eye and crumbles him up. She sees what Oliver is doing and leaves to toss him against the wall. She goes back to Kerry and Syd to kill them. David gets very frustrated with the door thing and summons his massive psychic powers to send everyone back to their bodies in the real world. Rudy wakes up and gets out of the wheelchair to attack Lenny and send her into the void. When everyone is back in the bedroom in their bodies, the room unfreezes and the events begin to move forward. Cary is able to put the halo on David’s head. The bullets look like they hit David, but he uses his powers to catch the bullets. He drops the casings harmlessly from his hand. The Eye is in the real world and he painfully dies. David transports everyone back to Summerland. They carry Rudy’s corpse back to Summerland. The halo has isolated Farouk in David’s mind. Melanie goes to Oliver’s cryogenic chamber and opens his diving suit mask. When she joins the others, Oliver is back in the real world, serving breakfast and reciting poetry. Kerry is mad at Cary for leaving her when she needed him. Amy tries to apologize to David for not telling him he was adopted and not realizing he wasn’t mentally ill but had powers. David says with a bit of wonder in his voice that he is a mutant. Amy agrees; he is a mutant. David doesn’t want her to apologize, he isn’t mad at her. It’s apparent that David still loves her and doesn’t blame her for any of this. Lenny is trying to get out of the box she is in now, David sees a flash of the World’s Angriest Boy. Cary suggest they go to his lab to get Farouk out of his mind. Out of nowhere, Division III troops appear and surround them. We hear a familiar voice. It is the Interrogator (Hamish Linklater) from Chapter 1. Half of his face is burned, courtesy of David’s rescue. He and David have much to discuss. He orders his troops to shoot everyone else. The song “Art of Fear” takes us out of the episode. Things looked dark for David at the end of Chapter 6. Lenny had him locked in his own mind while she prepared to take him over completely. David was freaking out in his coffin when his powers started to manifest themselves. He is able to connect to his rational side and bring out British David. It was funny hearing Dan Stevens use his real accent. Of course, your rational side would sound British. The classroom scene was a great method to do a huge exposition dump while allowing David to piece together his story and come out of it stronger. Once he knows who he is, what he is confronting, he is able to move forward and take action. With the triumphant music in the background, David took his first steps towards being a superhero. We also got an earlier exposition dump when Oliver and Cary told us the parasite is Amahl Farouk, the X-Men villain known as the Shadow King. Before, we received hints of the X-Men connections; now we know they are in the proper X-Men universe. I don’t expect Jean Gray and Logan to stop by next season, but we know these mutants are in that universe. It is also clear that David is Charles Xavier’s son. The horror movie scene might be their best one yet. Creating a silent film horror story was brilliant. The use of black and white, no dialogue, the intertitles, with the eerie music score made it very surreal. Aubrey Plaza movements made Lenny appear to be an otherworldly monster. After it looked like our heroes had scored a major victory and could go home to celebrate, we get a great cliffhanger with Division III showing up. I’m not surprised they reentered the picture, but the shock was seeing a burnt up The Interrogator leading them. I just assumed after the attack on Division III at the pool; he was dead. This is a comic book show so you can’t assume anyone is dead, or is going to stay dead.